This easy tiramisu recipe from scratch is divine. What a creamy and dreamy dessert. I also divulge my homemade tiramisu cake recipe that is wonderful. The secret is use homemade lady fingers and pure vanilla extract. In a medium bowl, beat cream with vanilla until stiff peaks form; set aside. Whisk mascarpone into yolk mixture until smooth and mix the whipped cream and mascarpone cheese mixture together. In a small bowl, combine coffee and Kahlua. 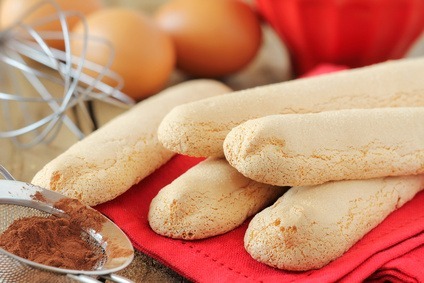 Split ladyfingers in half lengthwise and drizzle or brush on coffee mixture. Arrange half of soaked ladyfingers in bottom of a 7x11 inch dish. Spread 1/3 of cream mixture over ladyfingers. Repeat layers and sprinkle with cocoa on top. Cover and refrigerate at least 24 hours; 48 hours is the best. 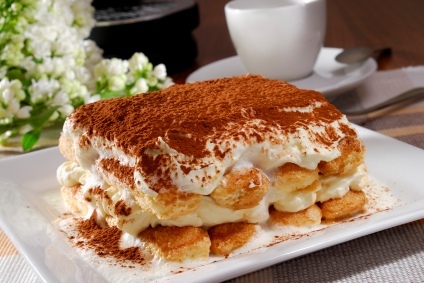 Now your friends and family will be begging you for this easy tiramisu recipe. These are much better than the ones you buy at the supermarket, and no preservatives. PREHEAT oven to 375 degrees. Line three jelly roll pans with parchment paper. Prepare a pastry bag with a size 6 tip (1/2 inch). You may also use a resealable sandwich bag and cut the corner. First beat the egg yolks with 1/2 of the sugar and all of the vanilla until light yellow in color; approximately 5 minutes. In a clean cold bowl beat the egg whites until they hold soft peeks. While beating, slowly add the salt and the remaining sugar until combined. Gently fold the beaten egg whites into the egg yolk mixture. Sift the flour over the egg mixture and gently fold it in. Fill the pastry or resealable bag with half of the batter and pipe 3 1/2 inch fingers, 1 1/2 inches apart, in rows on the parchment paper. Continue with the second half of the batter in the same manner. Sprinkle with sugar. Bake for approximately 15 minutes until firm to the touch and golden. Remove the paper and fingers from the baking sheet and place on racks to cool. After cooling, remove fingers from the paper and use, or store between layers of wax paper in a airtight container. These also freeze well.